My daughter loves playing with Dora sets, and we recently received the new Bath time set from Mega Bloks. Maddy loves playing with the snap together blocks and changing Dora's outfit. Changing the clothes is really easy to do, with just a snap, you can change Dora's skirt. All the accessories to have Dora get ready for the day, or get ready for bed, makes the Dora's Bath Time buildable set really fun to play with. I like that the set is complete for a time of play, and not too big to make a big mess with. There are other Dora buildable sets to get to add to the collection for a bigger play set area, so we can add on to the Bath Time, if we want. Maddy loves to get Dora ready, and loves to pamper Dora in her bathroom. Dora can take a bath in the tub, along with her little ducky, as well as comb and hair dry her hair. I love that the hair dryer and the comb fits into Dora's hand~ which makes the Dora doll more fun to play with. 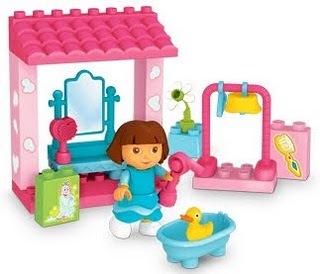 The Dora bathroom set is easy to set up, and there are several ways that a child can put together the bathroom area to make different scenes. Maddy likes to have Dora look at herself in her mirror and she also likes putting the little hangers on the rack with a skirt on it. I like that this set encourages Maddy to use her imagination, and it also fine tunes her motor skills with building and managing the smaller parts. I recommend this play set, and I love that the price is affordable, and that my kids enjoy playing with it. MEGA Brands Inc., has launched the Mega Bloks Family Club. Members receive: *A printable coupon for $5 off any $30 or more Mega Bloks purchase, *other exclusive offers, contests, sweepstakes and promos on Mega Bloks toys, *information on NEW Mega Bloks toys for kids ages 1-6, *an educational and informative blog by a leading panel of mom bloggers with articles on the benefits of construction toys, product reviews, pictures and more, * and a free e-mail newsletter with great new building ideas, toys for kids ages 1 and up. I was sent the Mega Bloks Dora's Bath Time buildable set from Mega Bloks and Team Mom. I was not compensated for my time or written review. The thoughts and opinions in this review are of my own and written by me.